Style and fashion might come handy when it comes to choosing and wearing the trendy clothes and staying fashionable. However, there are some tricks and tips that make our lives easier and help us to overcome some daily dilemmas, whether with our jeans, shoes or bra. The tips below might come handy. If you tend to wear a lot of boot cut or straight leg jeans, you might encounter some issues when wearing your boots over them. 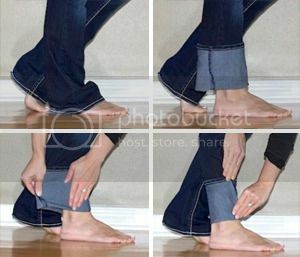 Zipping your boots right over your jeans might sometimes be hard due to bunched up fabric. It might also be unflattering and uncomfortable when the ankle looks bulked up. A solution to this would be to fold and tuck the jeans into your socks and then to wear your boots. If you tend to be annoyed by your bra strap constantly falling on your neck, you might want to add strap concealers to your clothes. This is a great DIY project to carry out yourself, you would only need some thin strips of fabric and add some press studs. We all that a pair of jeans that looks great on us but whose zipper has a tendency of going down. If you have been keeping that pair of jeans in your closet now might be the time to take it out. The trick to keep the zipper up would be to loop a key chain ring around your jeans’ button and on the zipper.